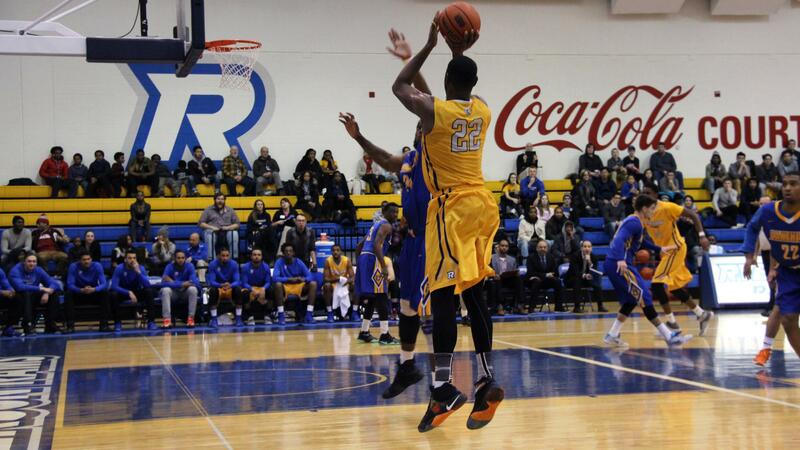 Ryerson’s men’s basketball team carried their perfect OUA record into 2017 with an 88-64 victory over the Lakehead Thunderwolves on Friday night at the Mattamy Athletic Centre. Adika Peter-McNeilly led the way with a game-high 20 points as the Rams capitalized on a strong second half to improve to 8-0 on the season and extend their lead in the OUA East. The Thunderwolves, now 2-6, should have been an easy opponent for the Rams, but it took some time for them to find their rhythm in their first game back from the winter holidays, making less than 37 per cent of their field goal attempts (14-38). Turnovers were the key to Ryerson’s success in the second half as the Rams scored 28 points off of 24 Thunderwolves turnovers. After edging out a 34-33 lead heading into halftime, the Rams outscored the Thunderwolves 54-31 in the second half. Even though both teams only finished with four fastbreak points, the Rams and Thunderwolves tried to push the ball up the floor for easy baskets in transition. Both teams struggled to finish at the rim, but Ryerson made more than 51 per cent of its field goal attempts in the second half (19-37), including five of nine three-point attempts. UP NEXT: The Rams aim for their ninth win in as many games when they face the Guelph Gryphons at the Mattamy Athletic Centre on Jan. 7 at 8 p.m.